XY and YR- Which do you prefer? How can you say they're not meant to be lovers. It's easy: Xiaoyao is entirely committed to Linger, particularly after he recalls what happened on the island during the tower episode. Yueru is aware of this and has given up on being anything more than a good companion to both Xiaoyao and Linger. Yueru is favorite character in the game, and I was very disappointed to see actress portraying her in the drama series. What's up with her sideburns???????? below yueru's ear in the pictures posted above. Chibi Jennifer wrote: hm? What side burns? it's just with our modern mindset that we find polygamy wrong...btw, i'm not mormon. 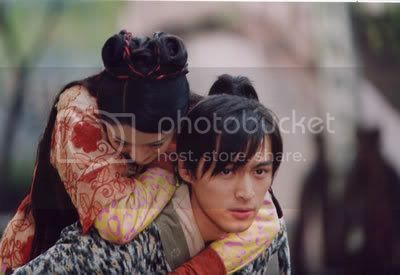 In the world of Xian Jian though, there's no one that has more than 1 wife..
LoL. 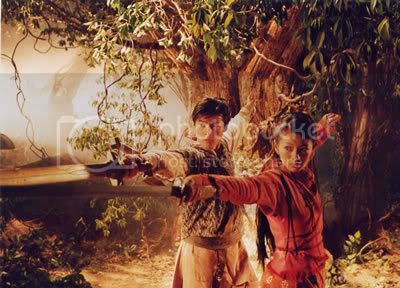 Remember when Xiaoyao was still in his village and he wanted Xiulan to be his slave and, um, the other girl (I forgot her name) to his concubine? Hmm, then who's his wife...? LOL!